This was our easiest stay with Kids in a hotel. We had been searching for a one week getaway from Prague with kids and we found this family oriented Hotel with 4 Indoor Playgrounds, a Swimming Pool, Outdoor Playground and with all the equipment for kids you can think of. Perfect for Winter and a Summer stay. My report is from a Winter stay but my Girlfriend with 3 babies just came back from a Summer stay so I will have her comments shortly. This is my longest artcile ever - but it was needed in case you go! Located in Jozefuv Dul, Jizerske Hory (Jizerske Mountains), the booking had to be made 7 months ahead – that’s how popular it is. From time-to-time someone cancels so don’t give up so easily. After all, 99% of guests have small kids and we all know how quickly our kiddies can change our best prepared plans. The whole area is very popular for skiers from all over the Czech Republic, thus further explaining it’s popularity in Winter. We went at the end of the ski season so the snow was melting away as you will see in the pictures. Dont worry - there is lots of snow throughout the whole winter season. The first time I called to make a reservation was 2 years ago and I thought 2 months ahead will be just enough time to secure a booking. What a mistake! I was told they are pre-booked for another 11 months….in regards to the winter season. Its not always easy to plan so far ahead so this time I just put down the phone feeling disappointed. The next time I called was in Summer 2010 and I managed to get a booking for March 2011. My lot and the Bravo family were ready to push our luck. I have to admit it was a bit of a gamble, because they wanted 50% pre-payment. Its not like you have to PAY it the moment of the reservation, they would give you some time, but you have to pay it eventually and hope your kids wont get sick. It is the Summer season now and my girlfriend with 3 kids got a booking there 2 weeks prior to their visit so in Summer it isnt so bad. The reason behind this is, not only are they popular but 60% of their bookings goes towards Winter Camps for schools and pre-schools. So, I already have a booking for February 2012! Funny enough PEKLO means HELL in Czech. The decorations in the hotel are in keeping with the name. I have not discovered why hotels and slopes in this area have devilish names. Like the slope: Lucifer, it’s something to ask the next time we go. 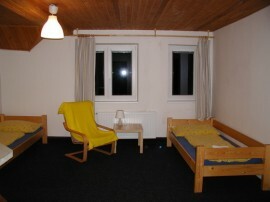 The place is great not only for a winter skiing week or weekend trip but also for a summer get away. I am planning to squeeze ourselves in for a sporty weekend this Summer. The PEKLO*** Hotel has 2 categories of rooms. A and B. A rooms: have their own bathroom and toilet and some of them have 2 bedrooms. The one we stayed in and can recommend is A3. It is also the only one out of A rooms that has a kitchenette. Some pictures of A rooms you can see: here. My opinion is the best room to book is A3, then A1, A2 and possibly A11, A12, A16 and A17 (the rest of the A rooms are mainly on the 2nd floor with steep stairs and they are not so nice as the ones I mentioned.) I will ask Zuzka Bravo to make a comment about her room when I am done. She wasn’t so thrilled, but I dont remeber the number of her room right now. The B rooms: share bathroom facilities located in the corridor. It is great for families who have many kids and need to save some money. Of course the best possibility is to have the A room, but from what I saw the B rooms are good as well. If we went for a weekend we would be happy with the B room. If you go for a B room the best would be B1, B2 (The biggest B rooms), not B14 and B15 because they are right next to the “highway” of corridors with a squeaky floor right n front of them. They were on the way to our room and I felt pretty bad for the people staying there every time we had to pass their room. That must have been pretty annoying. The Hotel had 2 wings that are connected with a Ski Storage and Changing room. We stayed in the main wing where the restaurant and the biggest indoor playground is and it was very convenient. If you could stay in this part I think it is better. My sister and friends stayed in the other wing where the swimming pool is and they had a bit of a walk. Also the stairs there are quite steep. Right opposite the Swimming Pool and Sauna entry there is a 2 bedroom family room in the second wing and that I would recommend as well. It looked nice and spacious. Although, it was under the stairs so I am sure the people living there may get some noise. The most amazing thing about the hotel are its Indoor Playgrounds that are everywhere and the pro-kids attitude. You will not get a waiter complaining about kids running around and making noise. Such things are no issue here and I am telling you – its quite relaxing. When your kid gets lost - somebody will find it and bring them back to you and there are always plenty of other kids to play with. You have to park behind the building where the connecting Ski Storage Hallway is. Through here everybody unloads and packs the cars. The outdoor parking is for Free but you have to get a Parking Card with your room number on it. This requires a 200 CZK deposit which you will get back on departure. When you unload - you park your car at the hotels parking place accross the street and go to the reception where you will be asked to pay for the rest of your stay, get keys and find out basic info. All the skis and sledges you keep in the LYZARNA (The Ski storage Hallway) as well as prams. Here you also keep the ski boots. From this room you enter the hotel in slippers or some other home shoes. NOBODY WALKS IN THE HOTEL IN SHOES. Thank God for Crocs – they were perfect here. You are not allowed to walk in shoes anywhere inside the hotel so you always must leave your regular shoes in the LYZARNA. At the reception you should note the swimming hours – you have to pre-book the pool as I will explain later. The same thing you need to do for cleaning. You can borrow any board games at the reception for free. Also WiFi is free and the hotel is well covered. The password hangs on the info board outside the reception office. The unpleasant surprise it that the Swimming Pool and Sauna fee is not included in the stay. They have special offers for 3x and 5x entries for the whole family or 1 adult and child. It’s definitely more convenient. The pool has a capacity of 8 people and it cannot be exceeded. For us it worked out great, because we were 2 families (8 people) and always went together. So we had the pool all to ourselves. Usually if you book 6 people in – nobody else will book in with you. Outside the office there is an info board where the printed table for the pool schedule is. You choose the time and days and write the number of your room and how many people there will be. This also allows other people booking in to see when the pool is still half empty or select another other time. The same goes for clening. You want your room cleaned? You have to mark it on the chart for the Houskeeper. The pool was great and I have no clue where the kids got the energy to spend the whole 1 hour there every day after skiing. In 7 days we took the 5 day entry card and I wished we had taken the 3 entry card! Since the dinner is served till 19:30 it was perfect for us to book the pool every evening at 17:00 right after we came back from skiing. Most of the slopes close at 16:00. We are quite a sporty family and it was relaxing to jump into the pool after the whole day on skis. You can imagine we slept like babies and by 22:00 every body was half-dead. This way it doesn’t really matter that the hotel is a typical mountain bungalow. Everybody is gone to bed by 22:00 not disturbing any other hotel guests. Seems like everybody has the same schedule there thank to the kids so it all works out just fine. We purchased half-board. Considering most of the day you are gone – never mind if it is winter or summer, it would be a waste of money to get full-board. There are plenty of restaurants and kiosks within the whole mountain. Funny enough the system of booking the food is a bit complicated and we needed to explain it in English to several foreign guests staying at the hotel. We were actually surprised there were so many foreigners there, it seemed to me that everybody spoke English. And after all our group was quite interesting too; me, my sister and friend – we are all Czech but with funny foreign surnames because of our mixed marriages and we speak English at home. So you will be given a table that will stay yours until the end of your stay. As with most Czech Mountain hotels, you have to get your dinner from one window – returning the dirty dishes to the second window. Breakfast is always a set buffet with salami, cheese and ham selection plus basic stuff like butter, cereals, jams and every day a different hot dish such as sausages, boiled eggs, pancakes. That’s it. The breakfast buffet isn’t sufficient and even the Chocolate Nesquick Cereals weren’t original and tasted rather funny. Definitely a cheaper version of it. Once I asked for scrambled eggs and I was given 2 eggs with like a kilo of chopped onion (the typical village way) but I couldn’t eat it. The second day we went to a local grocery shop and bought ourselves stuff we were lacking. This we stored in the fridge in the dining room that is there for all to use. The dining room has a kitchenette where you can prepare any kind of baby food. It also has kids IKEA cutlery and bibs. What is great – the dining room has a changing table right there. You book your meals for each dinner ahead of time. The menu does not change. You will be given a paper sheet on your table where you mark which meal you wish to have the next day. The meal has no numbers so you have to remember to put it into the order sheet as follows. The meal on the first position of the list for the NEXT DAY mark as 1. The meal on second position mark as 2 and obviously the meal on the third position mark as 3. You will need a dictionary here if your czech is limited because the menu is only in Czech. I will talk to the owner soon and will ask her for English Menus, but until now – only a Czech version is available. The kids meals also have to be marked and they have a boxes for adult meals and kids meals. You see? I am already getting lost. If this doesn’t help you – they will have to explain it to you somehow. All the guests speak with everybody there so I am sure someone will help you out. And if you know you will be late for dinner – ask them to leave it out for you. You can also cancel the meal from one day to another and you will be given money back. For this you need to talk to the Restaurant Manager. As I said, there are 4 of them. It feels like they are everywhere. Your kids cannot get bored here throughout their stay even if it is a long one. 1. The Main Indoor Playground - is in the main wing above the restaurant. It is the biggest one and my boys would go in and out by themselves. Luckily somebody clever – probably the experienced owner herself (lately the mother of newborn twins and one older child) made a window to the hallway so you can go and check on your kids anytime you want to, it is well exposed and bigger kids who are safe to walk around the hotel on their own – use it as an entrance and exit. Meanwhile the babies are locked in behind the safety gate. It is genius and you can leave your baby there to play easily. Not only because it is well positioned but also because one of the parents is always there. 2. The Restaurant Play Area - is downstairs and perfectly serves it’s purpose to entertain your kid while you eat and relax. It isn’t in the main dinning room but in the Bar area with tables where you can take your dinner as well. Normally this Bar area is occupied after meals by parents meanwhile the kids are running around or playing in the Play Area. It also is in the main wing. 3. The big Play Area - in the other wing of the hotel. Usually the kids living in this wing would play there. It is good to have another option though, in case you stay the whole week. 4. The Smallest Play Area - is also in the other wing of the hotel and is small with a ball pool in it. Yet again – quite popular. The area is covered in ski runs so you just have to choose your favourite one. It is brilliant that you walk out from the Hallway of the hotel, cross the road and you are on the Kids Skiing slope. If you get bored of it just down the hill is another slope called LUCIFER with Kids and Adult lifts. The biggest one in the area is called TANVALDKSY SPICAK SLOPE and our favourite one that we spent most of the time at was SEVERAK. All the bigger slopes have their own restaurant with a sufficient amount of fast food and alcohol. SEVERAK is most suited for families with Kids. LUCIFER SLOPE – here we spent the first day before the snow became too heavy and we managed to experience on skis a fancy dress party. It was the last day of the season and they were celebrating it with the traditional Czech Masquerade on Skis. This day all kids in masks were riding for free. If you manage to make it there for this day you will have some nice memories. SPICAK SLOPE – is not only notoriously famous in the area but in the whole of the Czech Republic. It has blue, red and black slopes and is efficient for experiences skiers. This winter our boys 4 and 5 years started skiing by themselves. Yet – there were parts on Spicak we had to carry them down. It was very tiring for them and I suggest this for bigger kids. SEVERAK SLOPE – was exactly what we needed. Above the cashiers there is an Indoor Playground for the Kids who had tired of skiing. You can choose to feed your kids with fast food at the bottom of the slope or give them a proper lunch inside the Hotel right at the bottom of the slope. If it wasn’t for the Indoor Playgrounds I would happily stay in this hotel next time we go. There are 2 slopes one for Kids and one for Adults. The run was a bit short for me but when combination skiing with kids – perfect. Right there is an Outdoor Play Area on the snow where we spent efficient time. It costs 100 Czk per child/unlimited entry. I thought that was a bit too much. Within the Mini-School they have a special rubber carpet that takes the smallest skiers up the hill. Here they learn their first moves on skis in very comfortable way. Our cousin spent half a day there easily learning the basics. You can also hire an Instructor on all the sloapss. How they do in English – I don’t know – you would have to check. I assume you would find one. Every slope has its own Instructors and all you need to do is ask at the Ticket Box for a contact or to be told where to find them. Oh My God. How on Earth did I manage to produce such a long article I have no idea but finally I feel all the information is here. From what I can tell you at the end – I have sent 3 families there already and all of them came back satisfied. Now I deserve a glass of wine! DIRECTIONS: From Prague get onto the highway towards Jablonec nad Nisou. When in Jablonec turn or a round about towards Tanvald, Harrachov. Exit Jablonec (still going towards Tanvald, Harrachov) and the first village in Jablonec are Lucany. In Lucany - turn from the main road Towards Horni Maxov. The signs are missing here, but on the fence there is a small banner for the Hotel PEKLO. When you pass the Avicenum Hotel in Lucany turn towards the Hotel Maxov. Pass it and you will enter Josefuv Dul, go down the hill to the valley towards the church and at the crossroads - turn left - you will now see a big sign towards the Hotel PEKLO, leave the church on your right hand and take the first turn behind the church parking lot to the right (green route on the map). After 1600 meters you have arrived at the PEKLO hotel :-) In winter this is the safest route to Josefuv Dul, which runs through Lucany, Smržovka and Albrechtice in the Jizera mountains.